Wow this has been a busy week! 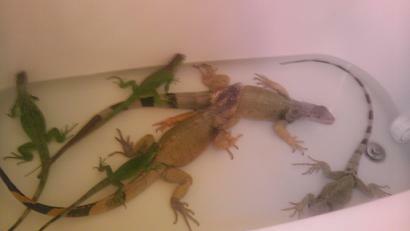 It’s hard keeping all these little iguanas in line. 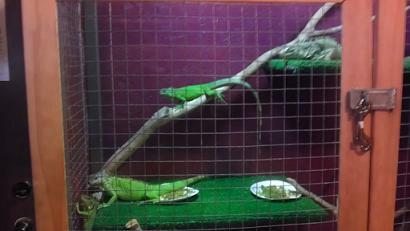 Earlier this week, mom and I met up with a nice lady who wanted to turn in 2 baby iguanas. She had taken them from a neighbor who wasn’t caring for them properly and didn’t have time for them. The lady gave them good food and proper lighting but she knew she couldn’t keep them forever. She already has 2 bearded dragons to care for. These are all 4 of the babies we have now. Mom went and got Wilma’s big cage from the rescue and they are loving all the space and branches to climb on. Wilma spent 4 years in that cage and I think she misses it because she keeps climbing in there with them. This is what bath time looks like now! How am I supposed to do my business in a tub this full?? And this is me. 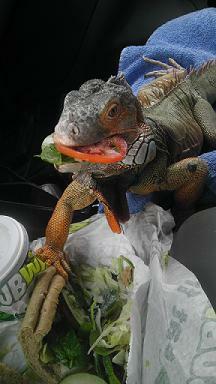 I didn’t get lunch before we left to pick up the baby iguanas. Mom was going to share some veggies off her sandwich but I had other ideas. I ate every vegetable out of a 6 inch sub! I even ate some of the bread. Lucky for me mom got the meat out or I probably would have eaten that too lol. None of that was particularly healthy for me but it sure was good! It doesn’t hurt to have a treat once in a while. The new ones do not have names. Mom is calling them little bit and bigger bit lol. They are both up for adoption. They are too young to be absolutely sure yet if they are male or female. If they don’t get adopted out this weekend, mom is going to take everyone to our doctor and have them checked out and sexed.